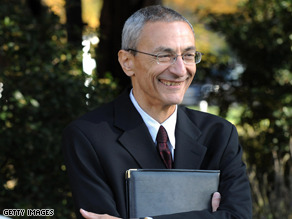 Podesta is heading up Obama's transition team. (CNN) - Barack Obama will have nearly named his entire Cabinet by Christmas, a top aide to the President-elect's transition team said. John Podesta, a former chief of staff for President Clinton, told Bloomberg News' Al Hunt "virtually the whole Cabinet" will be in place by the end of the year. Earlier this week President-elect Obama announced he was nominating New York Fed chairman Timothy Geithner to be his Treasury Secretary. He has also reportedly settled on Sen. Hillary Clinton for Secretary of State, New Mexico Gov. Bill Richardson for Commerce Secretary, Arizona Gov. Janet Napolitano for Homeland Security Secretary, former Sen. Tom Daschle for Heath and Human Services Secretary, and Eric Holder for Attorney General. Obama also reportedly favors keeping Defense Secretary Robert Gates in his current position. Though Gates currently appears to be the only Republican set to hold a leading cabinet post under Obama, Podesta said there will be "multiple Republicans" in the administration. I strongly believe that Obama got elected because God wants him to save this country. After the disasterous policies of Bush's 8 years of presidency, we all desperately need a president who has the intelect and the vision to save this country from the abyss that it currently is in. I see CNN closed the Bush's values story real fast. Bush has no soul to sale and he only has selfish values which I am sure he will keep. He need to be put on trail for his action and values. I think Obama should let Bob Gate go too because he serve with Bush and he might keep same policy. Now Bush make all the word hate Americans and the country hate each other so Gate should go too.